During the 19th century, Rockville developed as a textile center on the Hockanum River in the town of Vernon. Snipsic Lake at the northeast corner of Vernon is the source of the river. Within a mile and a half, the Hockanum drops 254 feet. Although a small river, the large vertical drop within such a short distance provided adequate waterpower for the small mills of the early and mid 1800s. Thirteen mill sites were developed along this short stretch of the Hockanum River. The first mill, the Rock Manufacturing Company, was constructed in 1821 by local entrepreneurs. Soon, the Hockanum was lined with mills. The early mills specialized in satinet, a cloth with a cotton warp and woolen weft, woven on hand looms. The introduction of improved power looms in 1841 began the transition to making all-wool cassimere cloth. The Civil War and the demand for woolen uniforms, saw significant expansion of the mills and the village. In the 1860s, silk manufacturing was established in Rockville. In 1855, Rockville’s population was 1,981. Over a third of the population was comprised of German, Irish, and English immigrants. Industrial expansion in the late 19th century brought further waves of immigrants from Canada and Eastern and Southern Europe. The 1880s, 1890s, and the opening years of the 20th century were Rockville’s golden years. In 1889, Rockville was incorporated as a city. 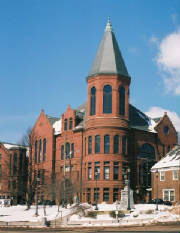 Memorial Hall was constructed as a memorial to those who served in the Civil War and as city offices. Fancy cassimere cloth and worsted cloth produced in Rockville by the Hockanum Company received awards at the 1873 Vienna Exposition, the Centennial Exposition of 1876, and the World’s Columbian Exposition in 1892. An Imperial Austrian Commissioner declared the company’s goods the equal of the best European woven products. In the 1900 Paris Exposition, Rockville mills were awarded three gold medals. U.S. Presidents Harrison, McKinley, and Theodore Roosevelt wore inaugural suits made of cloth from Rockville. 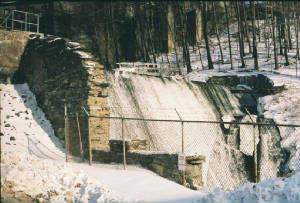 In 1906, the Minterburn Mill, a reinforced concrete building was constructed, the largest and last of the Rockville mills. Shortly thereafter, the Hockanum Company consolidated five of Rockville’s woolen mills, including Minterburn. M. T. Stevens and Sons purchased the Hockanum Company in 1934. Seventeen years later, in 1951, woolen manufacturing in Rockville ceased. The closure of the woolen industry was not the end of textile manufacturing in Rockville, however. Roosevelt Mills moved into the 1906 Minterburn mill in 1951, and operated a knitted outerwear mill. Textile dyeing and finishing continue at Rockville to the present day. The City of Rockville and the Town of Vernon consolidated in 1965. Its identity as the Loom City persists. The mills, many converted to other uses, remain. Rockville’s heyday is still visible in the public and commercial buildings from the late 1800s, the Victorian mansions of the mill owners and supervisors. The Maxwell Library and Rockville Hospital testify to the philanthropy of the mill owners. Start your tour of Rockville by clicking on one of the photographs above.